PUNCTURE A PICASSO…AND MAKE $11MM! Steve Cohen, the hedge fund impresario who just settled with the SEC, has let it be known that he recently purchased Picasso’s “Le Reve” from his friend, Steve Wynn, the casino magnate, for $150mm. 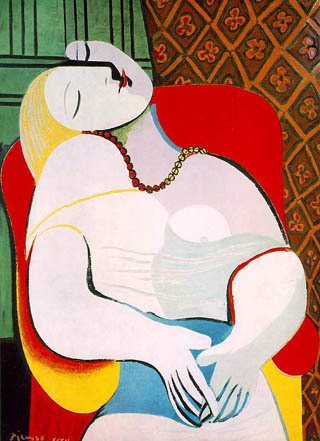 Steve Wynn purchased the painting, Picasso’s 1932 portrait of his mistress, Marie-Thérèse Walter, in 2001 in a private sale. It had sold at auction for $48.4mm in 1997. Not a bad rate of appreciation, no? The accident torpedoed that art sale, but that was because Wynn ultimately pulled the piece from sale. Fast forward to today and after some art restoration and some more time on display at Mr. Acquavella’s gallery, Mr. Cohen, still dying for the painting, reportedly paid his friend $150mm, or an additional $11mm for…. damaged goods???? Not in the eyes of the fine art world, baby!